Based on the long-running CBS TV shows, CSI is actually 3 Poker games in 1, with players able to select Miami and New York versions as well as the basic game that we shall review here. Although features and gameplay are the same, the cast of characters will change so that everyone will be able to see their favourites spinning up some nice wins. Released in 2012 by the IGT company, CSI is a 5-reel pokie with symbols in 3 rows and where players have the option to activate 1, 5, 10, 15 or all 20 paylines, although to qualify for all winning combinations that appear on the reels, they will of course need to have all 20 in play. This equals a stake of 0.20, which can be adjusted up a 100.00 maximum wager, and players win multiples of the amount bet per spin when 3, 4 or 5 of the same symbol type land across an active line running on adjacent reels from the left side. A subtle backdrop of a green graph sits behind the reels, making it look very technical and scientific. This is enhanced by the no-nonsense control buttons and payline indicators which all fits in with the theme and manages to look very effective without being a distraction. Like many games based on TV shows or films, there are plenty of actual images taken from the screen, although these are confined to the different actors who have appeared in the series. These will pay out the higher-value wins, but unlike many other pokies where playing card symbols will land the smaller payouts, here we have generic items from across the different shows. The lab pays 0.05x, 0.30x or 0.75x the stake when it lands on 3, 4 or 5 reels across an active line, and moving up in value there’s a strand of DNA, a flashlight and a thumbprint. Then it’s on to the cast, with Capt. Brass, Sanders and Willows all making an appearance, topped off by Ted Danson as D.B. Russell who is worth 0.50x, 5x or 50x when he lands across a line. Stokes is a wild symbol who can act as any of these regular icons if it’s then possible to complete a winning line or extend a winning combination across more reels for a bigger prize. But he’s just one of several bonus symbols that can turn up and award extra features, some of which are quite unusual and really help to make this pokie stand out and attract people who may not be fans of the show. If players land a winning combination and the Lock ‘n’ Respin symbol is anywhere to be seen, the symbols that made up the win will stay in place, while all others will spin again, guaranteeing at least another win and possibly landing some more at the same time. The Crime Scene symbol can turn up any positions on 3 or more adjacent reels to start collecting evidence for a reward. Each time this happens, players see the evidence meter below the reels start to fill up and once they have blood, a bullet, shoeprint and fibre filling the meter, a prize is automatically paid out, and although it’s not going to be anything huge, it’s still fun to see the meter filling up. The CSI logo symbol is a scatter, meaning that it can appear in any positions, and as long as 3 or more land, players will be awarded entry to a free spins game where all prizes are doubled in value, but only if evidence collection has already begun. The number of spins depends on how many scatters triggered them, with just 3 symbols need to get 5 free spins, 4 of them will see 10 play out and anyone who lands 5 logo symbols at once gets a big boost with 30 free games awarded. IGT have a number of TV-themed pokies, including the hugely popular Family Guy, and to ensure a long life for them, they have wisely chosen long-running shows to base their games on. CSI has been around for several years and has built up a wide fanbase, many of whom are likely to play at casinos, both land based and online, so it’s a natural fit. The game is well designed, with photo-images of the main cast and while normal play is fairly standard, the bonus features are quite unusual. 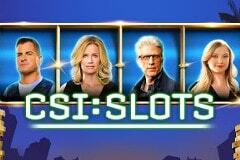 This means that anyone looking for something a bit different should try the CSI pokie, even if they are not fans of the show, as they will be able to experience some interesting bonus rounds and potentially pick up some decent winnings along the way.